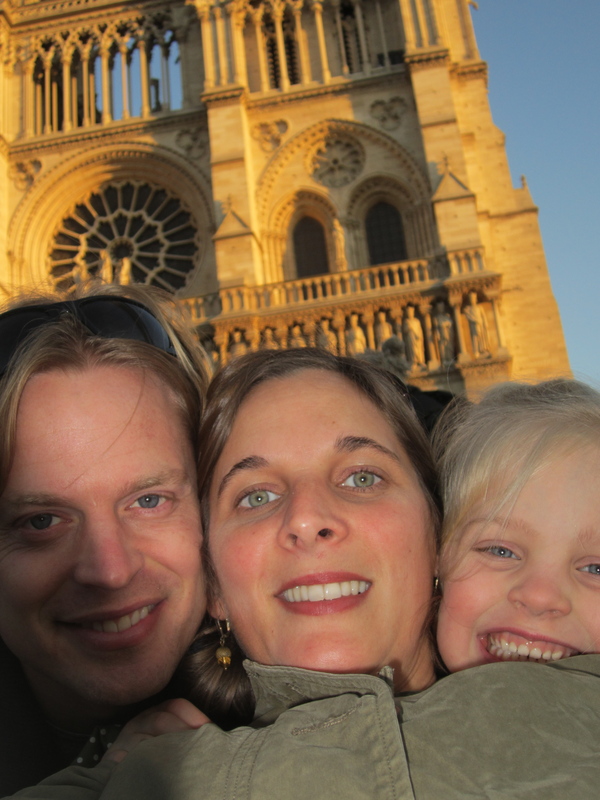 My husband is from The Netherlands, which means we have to budget in travel to Europe if we want to see his family. And because we do want to see his family, we have “vacationed” in Molenhoek, a small village just outside Nijmegen near the Dutch-German border, about once a year since Jasper moved to the U.S. back in the mid-90s. While it’s always fun to go to Holland, in many ways it’s not so different from visiting my own family in East Texas, so whenever possible we schedule side trips to bring an element of adventure to our family visit. 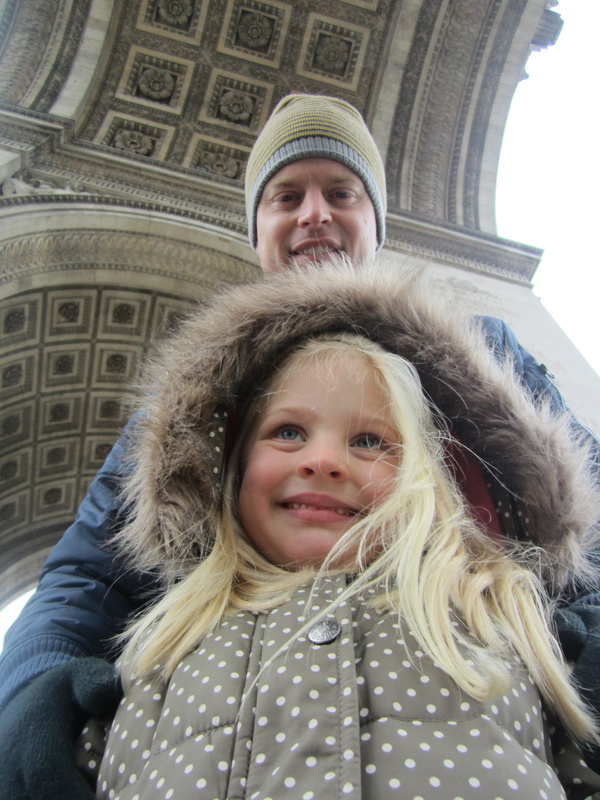 This year, we were lucky enough to spend a week over Christmas with the Familie Smits then travel with our five-year-old daughter to Paris for New Year’s Eve. 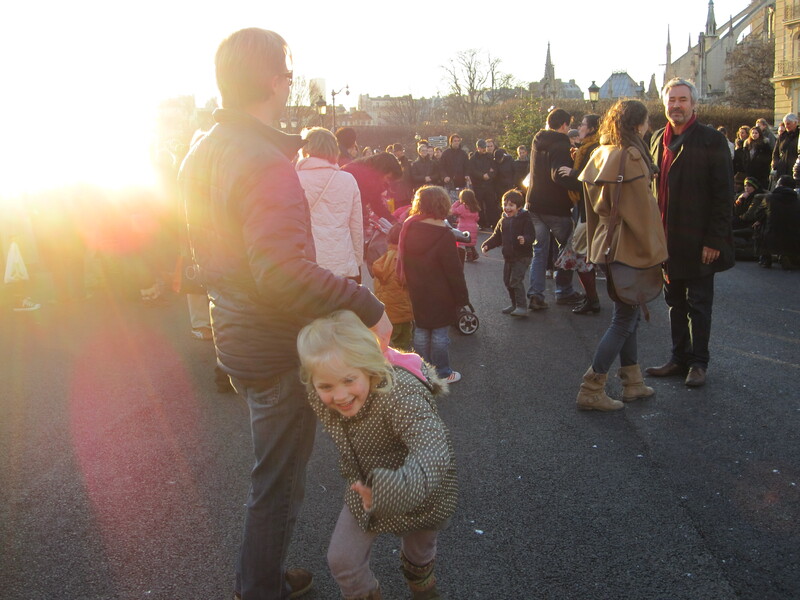 We had a blast and found Paris to be very family friendly. We just got back a week ago today, and it’s already hard to believe we actually had so many incredible experiences. 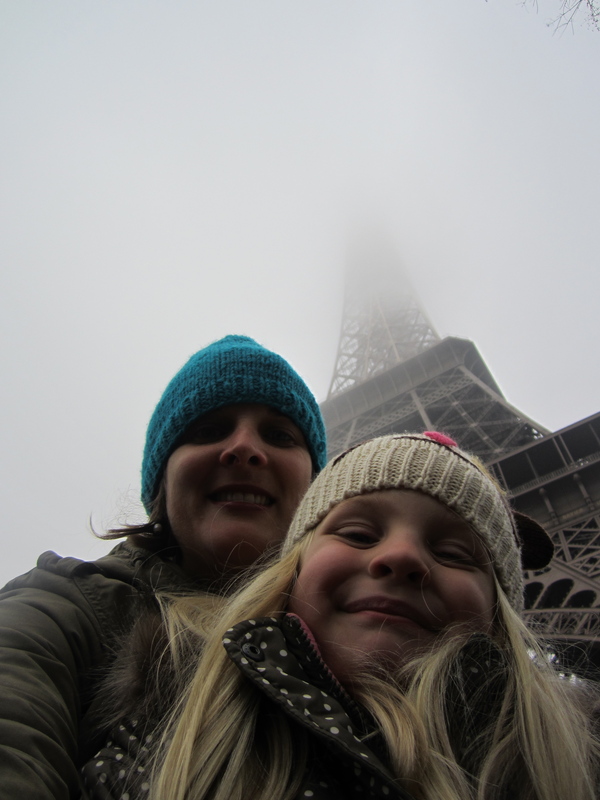 You will go to the tip top of the Eiffel Tower no matter how foggy it is. In part because you paid for reservations months in advance, but mostly because your child wants to. 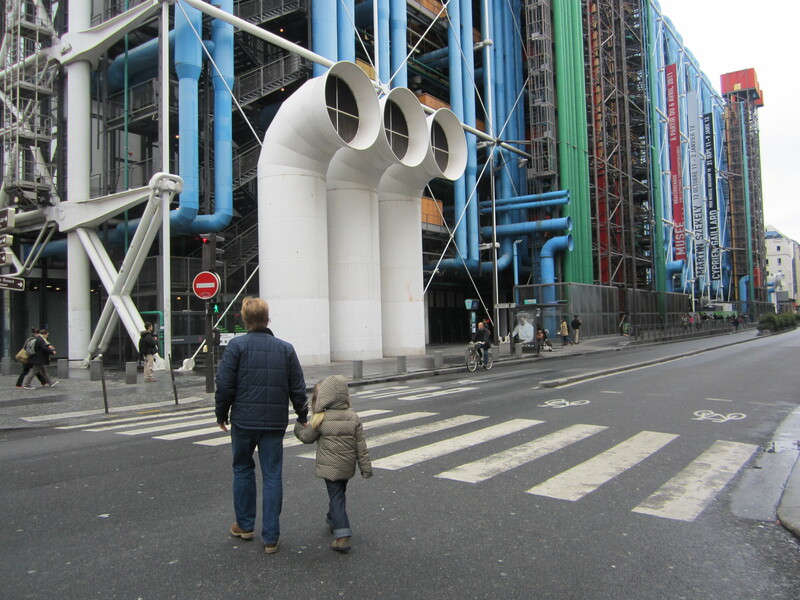 You will be persuaded that the Centre Pompidou closely resembles a bounce house. 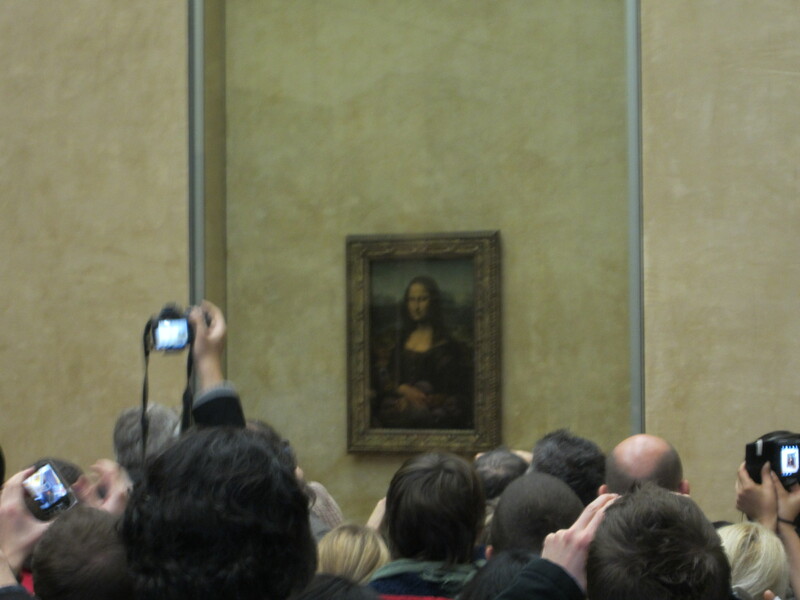 Also, you will make a game of looking for Picassos in order to squeeze an extra 10 minutes out of your visit. You will stop here every day. You will agree that Berthillon ice cream really is the best on the planet. 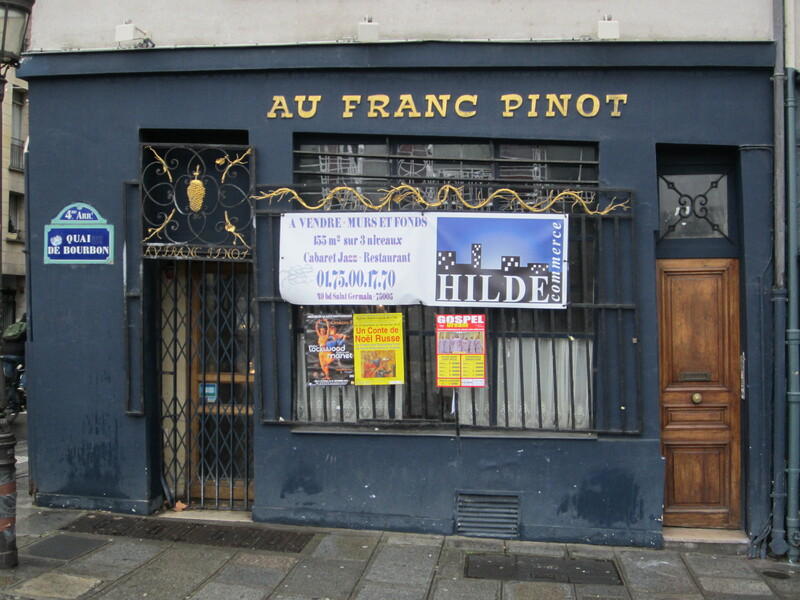 You will not go here or any other jazz joint. Nor will you leisurely peruse the shelves of Shakespeare and Company or wander into the scores of inviting antique shops. But you will ultimately spend the seven euros on an omnipresent TinTin figure which will be lost before the day is over. 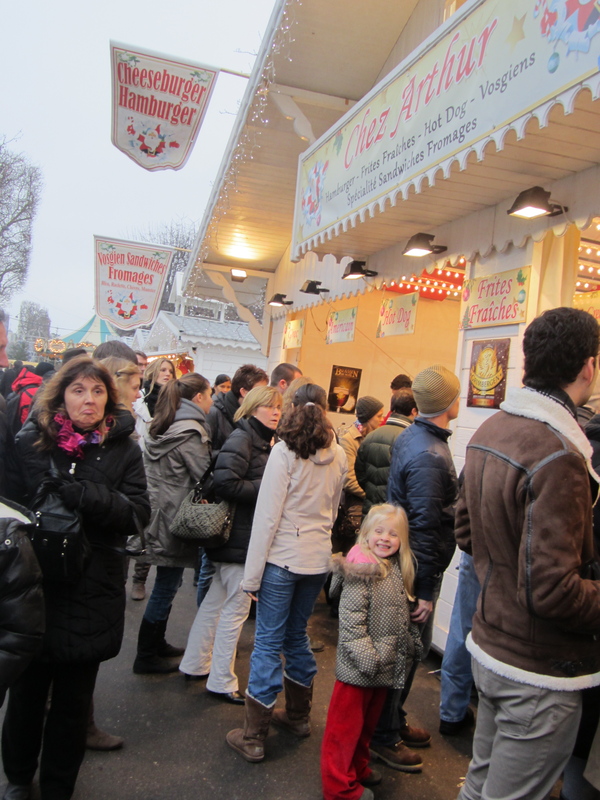 You will draw the line at snow globes and Eiffel Tower key chains. 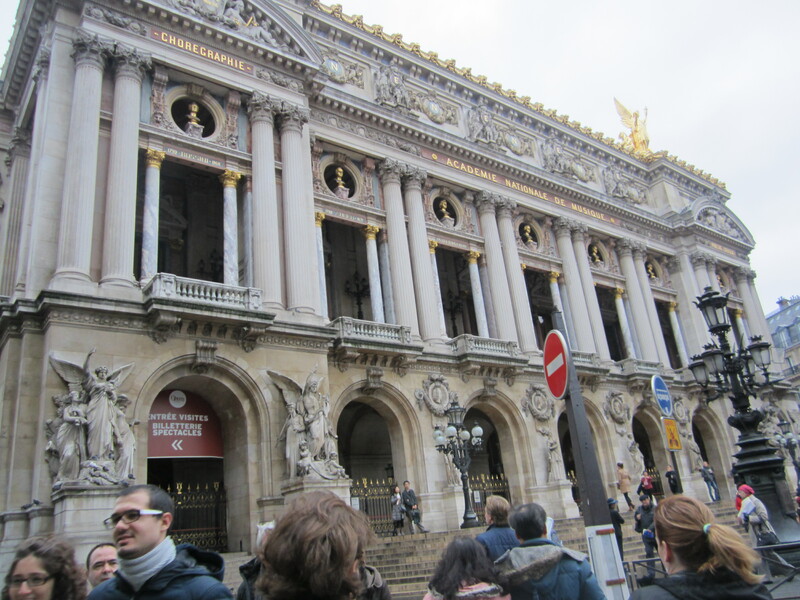 You will walk past the Palais Garnier, but you will not go inside. 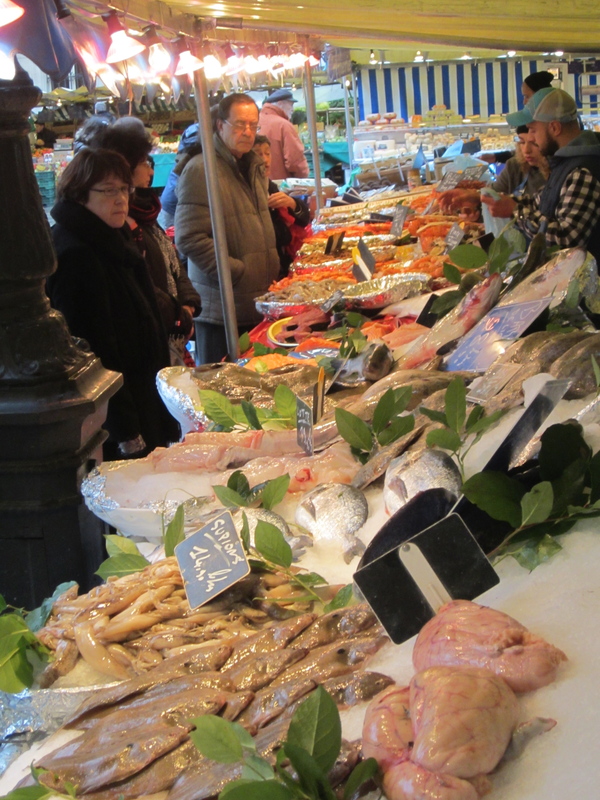 You will not get dolled up for a culinary experience at La Tour d’Argent, but you will dine finely in your cozy apartment after stumbling upon a dinner of fresh oysters, shrimp and roast chicken. You will cram into a tin can masquerading as an elevator for the six flight climb to the top, but choose to take the stairs down. You will occasionally make one stop too many. 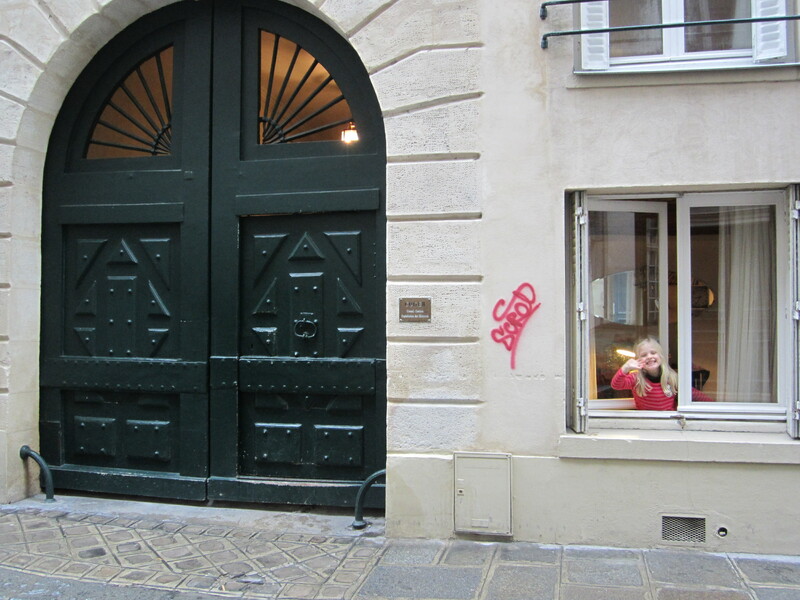 You will be even more appreciative of books like Madeline, which provide an opportunity to make a game of looking for things like “an old house in Paris that was covered with vines.” You will be a tiny bit disappointed when you cannot find the quintessential Bemelmans. 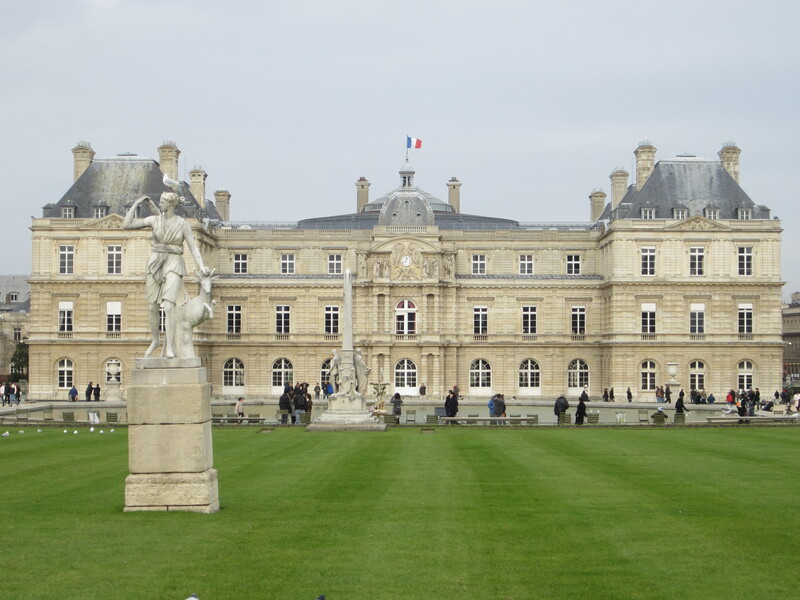 You will forget you want to know what this beautiful building is. You will not forget to enjoy the view. 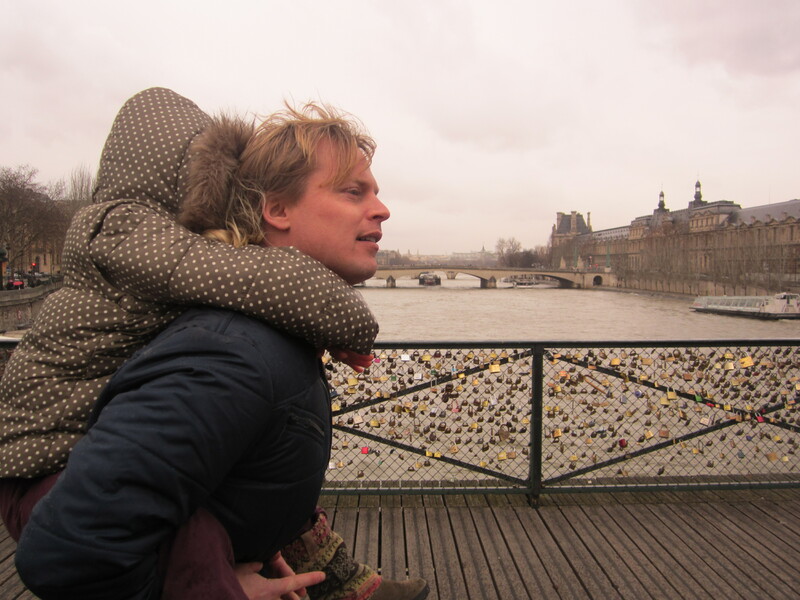 You will remember to bring a lock to put on the Pont des Arts, but your child will be more interested in her ice cream than making this memory with you. 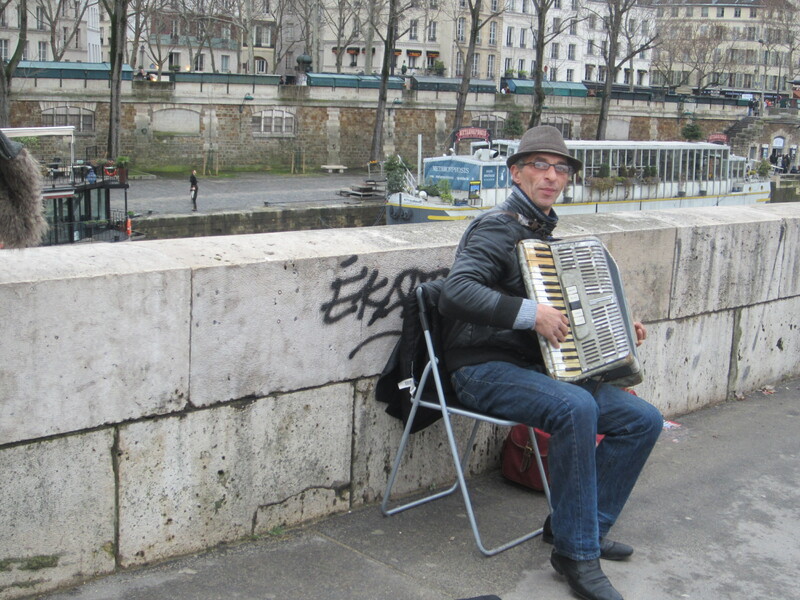 You will also sing, “I love Paris in the winter, when it drizzles.” And your back and shoulders will hurt at the end of the day. 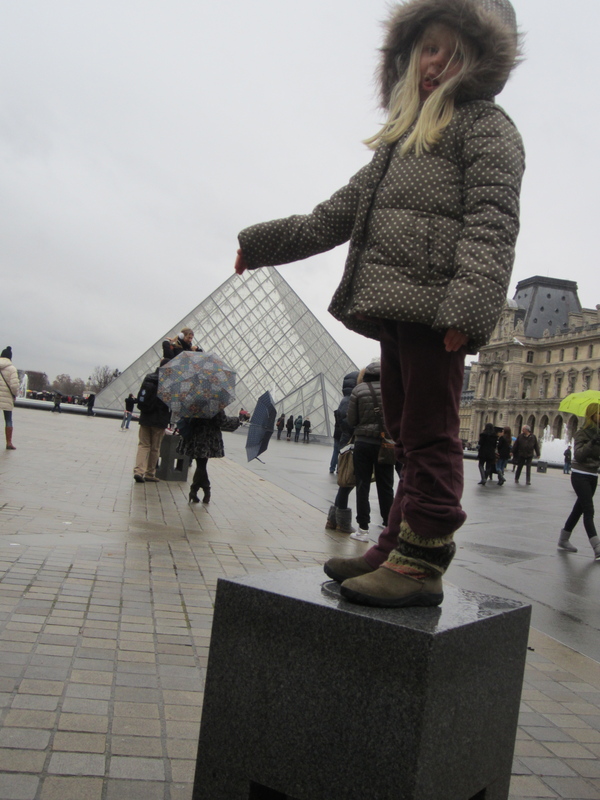 You will elect to go back to the Louvre earlier the next day rather than stand in line for 1.5 hours. But you will not leave before doing this. 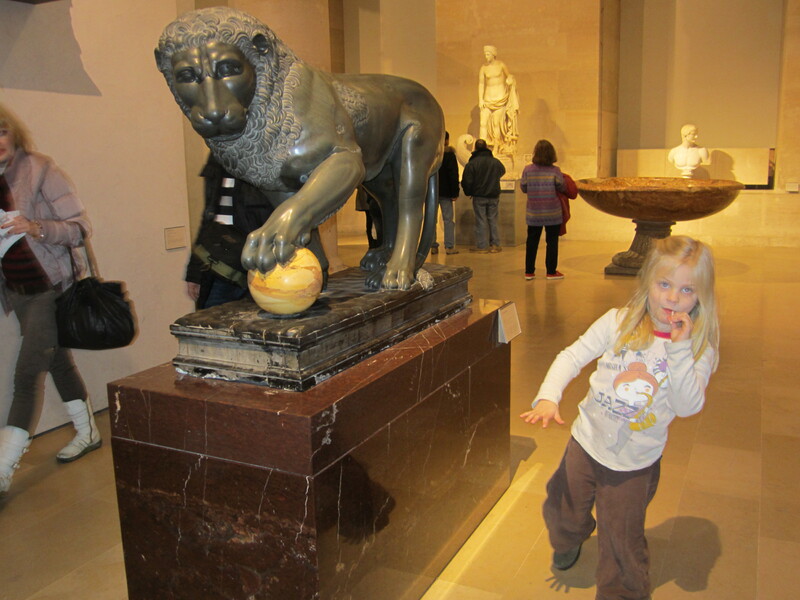 You will power your way through the Louvre’s vast galleries, trying to make art “fun.” You will have some explaining to do when your child sees a painting of a head on a platter amidst scores of crucifixions. You will be told to remove your child from your shoulders even though it’s the only way for her to see this. 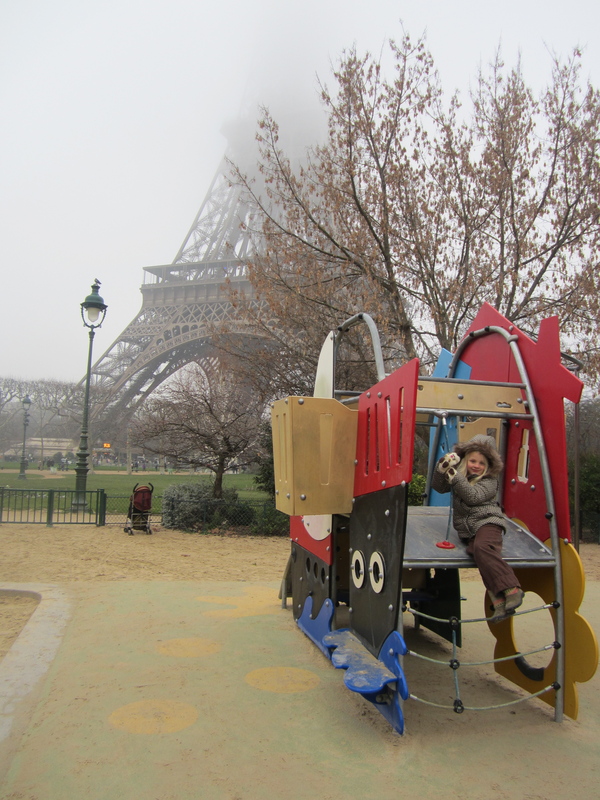 You will see many beautiful landmarks on your way to playgrounds. 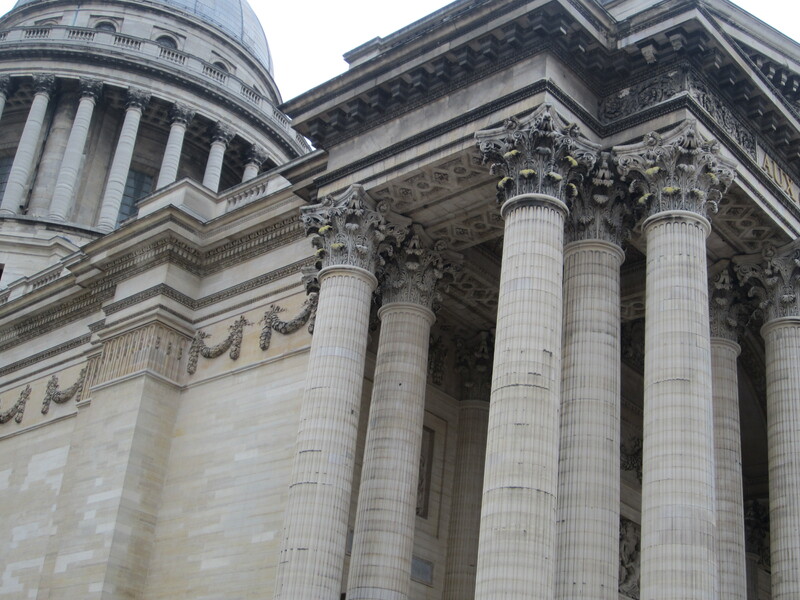 You will try and take arty photos of the Pantheon while holding your child’s hand crossing the street. You will not read any of this man’s novels, even though it seems like the right thing to do. You will know your child is tired when she asks if you want to stop for coffee. 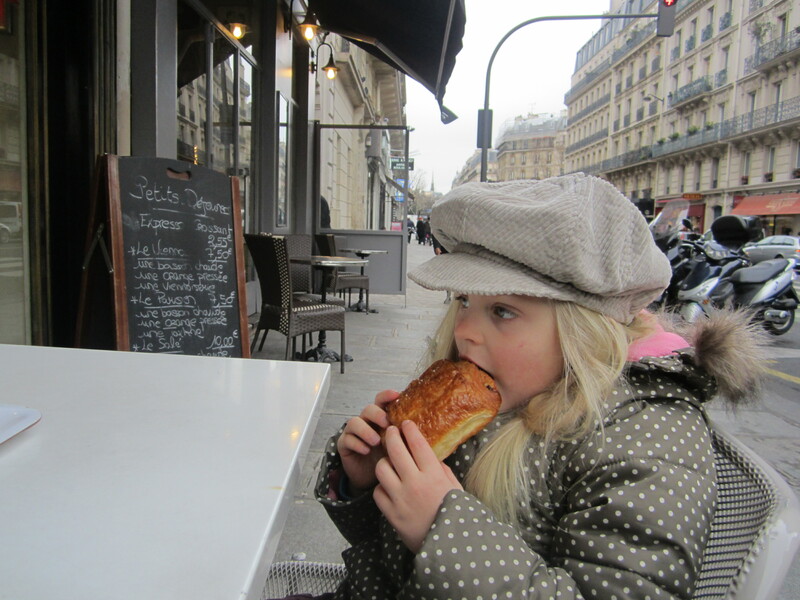 And you will sneak bites of her pain au chocolat when she’s not looking. You will take the touristy night boat and enjoy it. 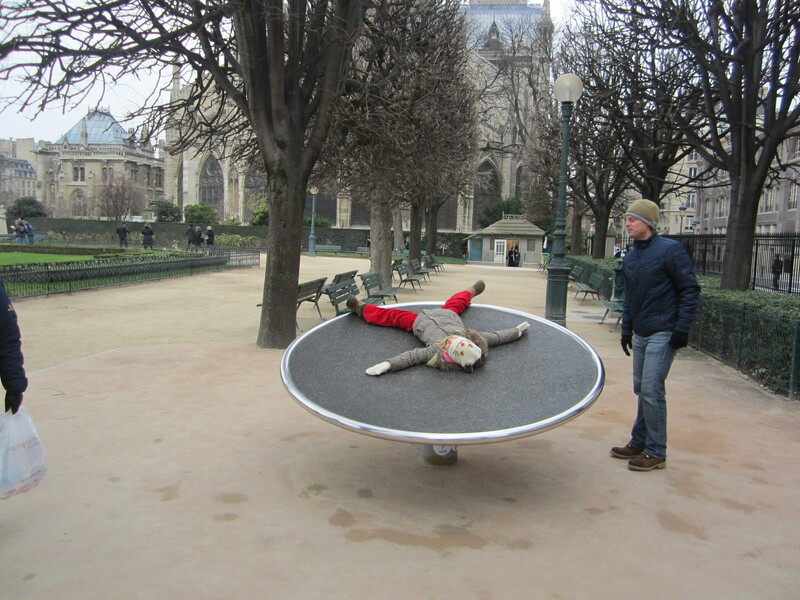 You will be impressed by how much pavement your kid is willing to pound. 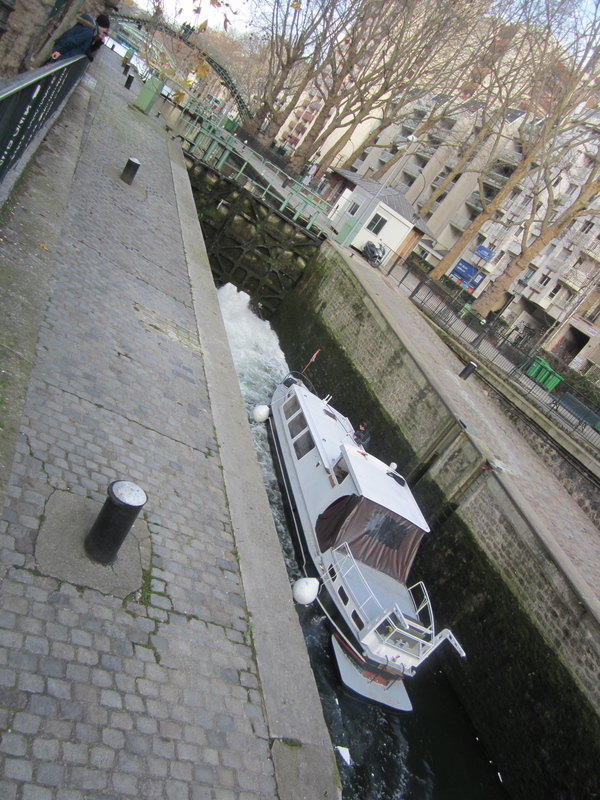 You will watch the locks open and close on Canal St.-Martin as you wait for a friend of a friend who will teach you about bobo chic and take you to lunch at Chez Prune, where you will have your best Parisian meal.. Even though your child will fall prey to the repetition of subterranean film advertising. 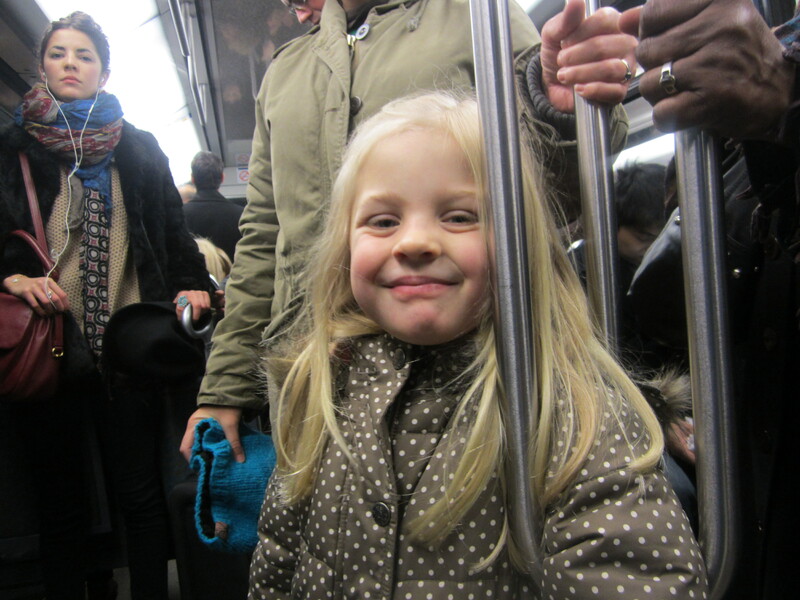 As a result, you will take her to see “Le Chat Potté” (Puss in Boots) within days of your return home. 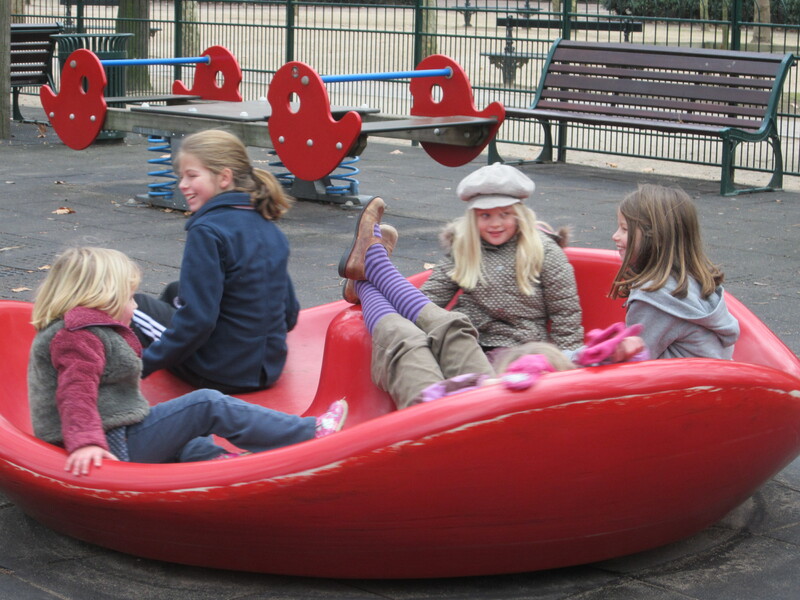 You will get a kick out of seeing your child make friends with a family of expats in Luxembourg Park. 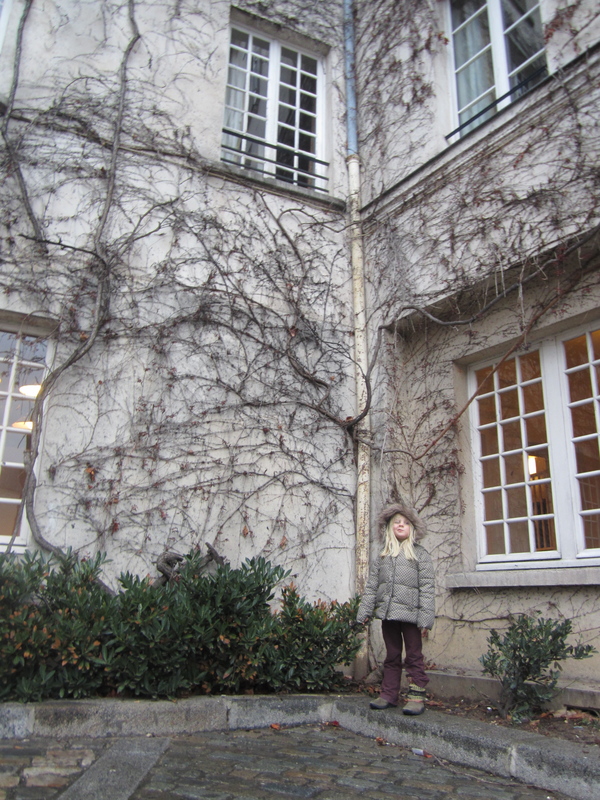 You will think every beautiful building will be just a tad prettier with your child in front of it. 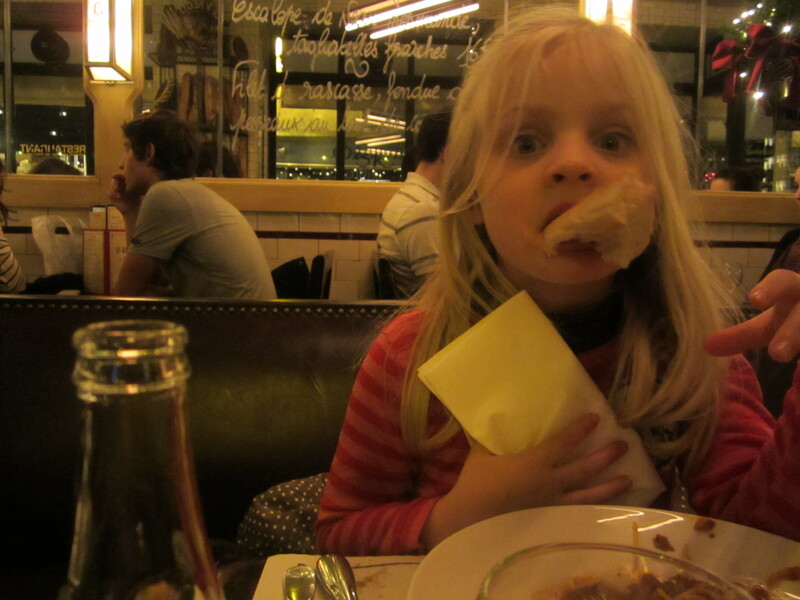 Your child will eat spaghetti bolognese more times in one week than she does in the average year. 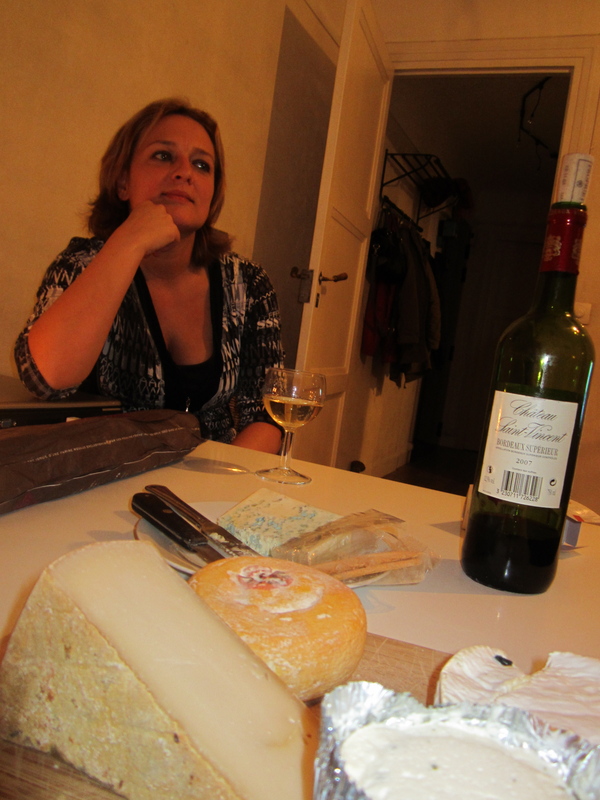 You will muster the courage to buy pungent and unfamiliar cheeses from the neighborhood fromagerie, and forgive yourself for the almost daily wine feast. You will think your 300 square foot apartment has everything you could possibly need. You will vow to simplify when you return home. 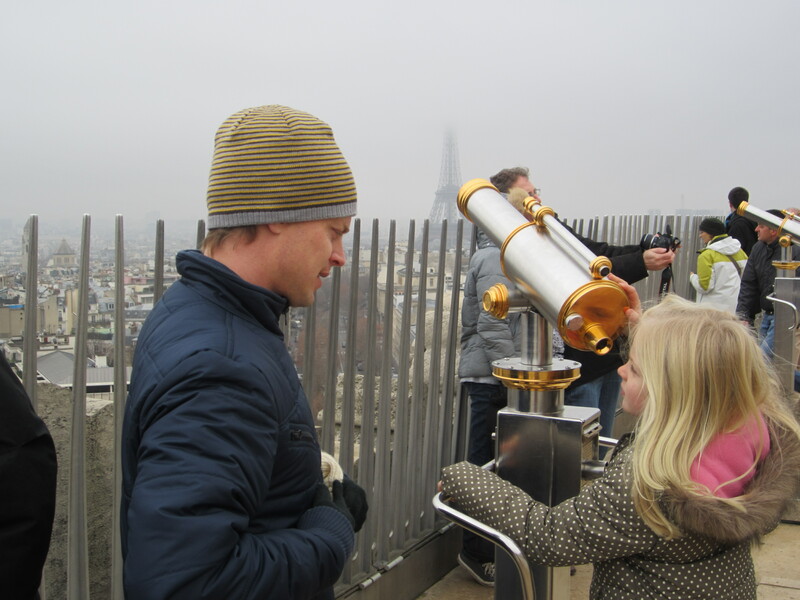 Where you will then pay two euros for a telescope that does not have the magical power to see through fog. You will have a blast with people like these. 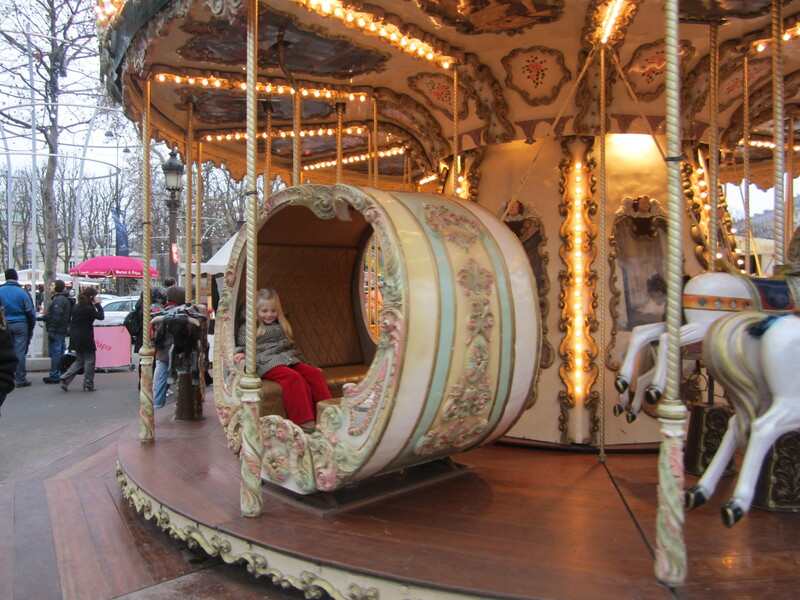 You will mistakenly believe your child has enough energy to walk all the way down the Champs-Elysées to the Tuileries Garden without eating lunch, and you will bribe her to continue with a carousel ride. Then you will buy her a hamburger. 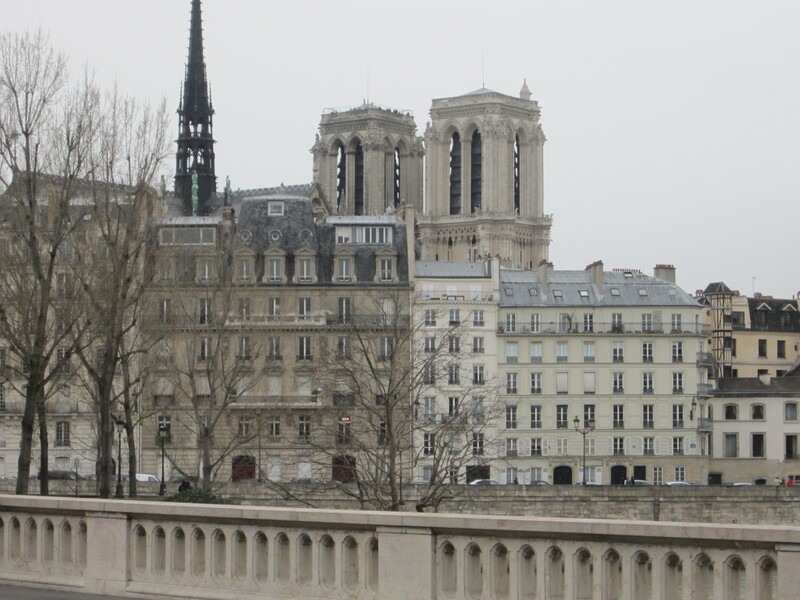 You will spend a lot of time spinning behind Notre Dame. You will pause and enjoy listening to this man play. You will want to leave him a euro, but your husband has all the loose change, and he and your child will already be on the other side of the bridge. 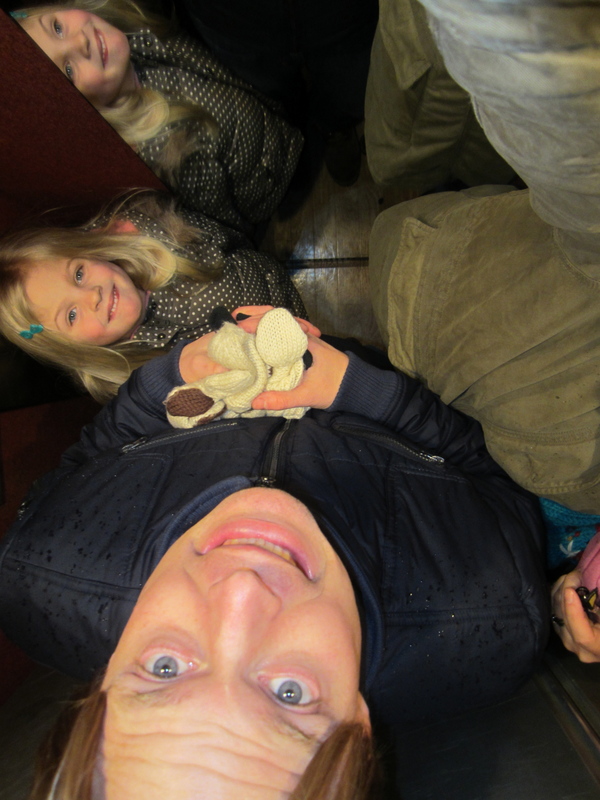 You will find yourself in a small percentage of photos. 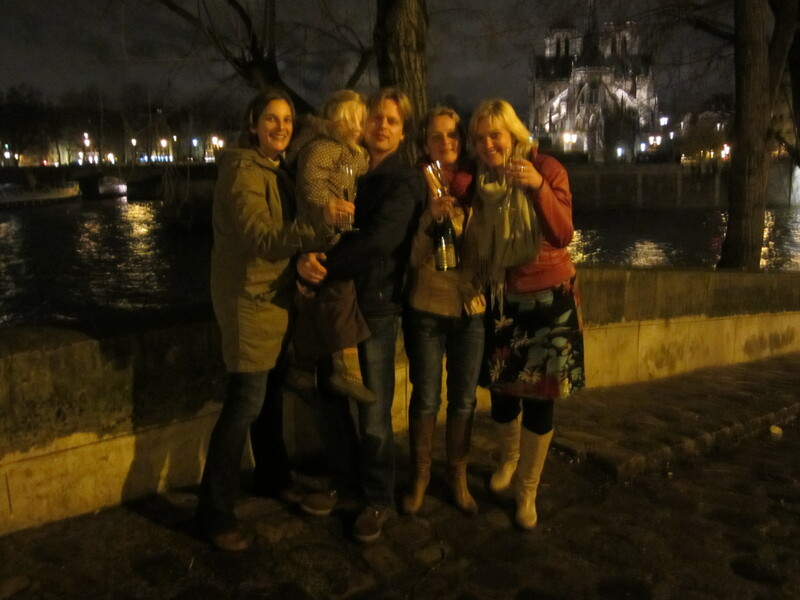 If you happen to be in Paris on December 31, you will let your child stay up until midnight, because you want her future self to know she once celebrated New Year’s across the Seine from Notre Dame while watching the Eiffel Tower twinkle. You will remember this day forever. 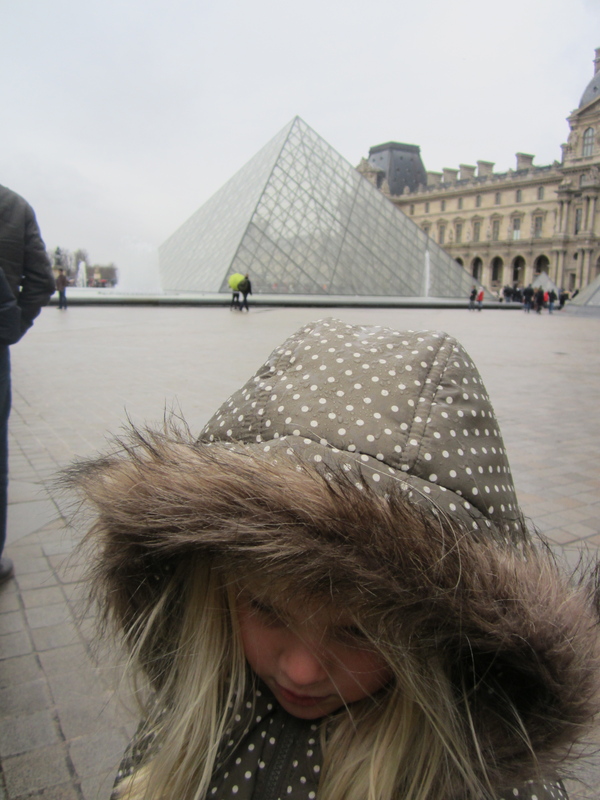 This entry was posted in Children, Family, Parenting, Travel and tagged France, Paris with kids by Jill Coody Smits/ little traveling seeds. Bookmark the permalink. 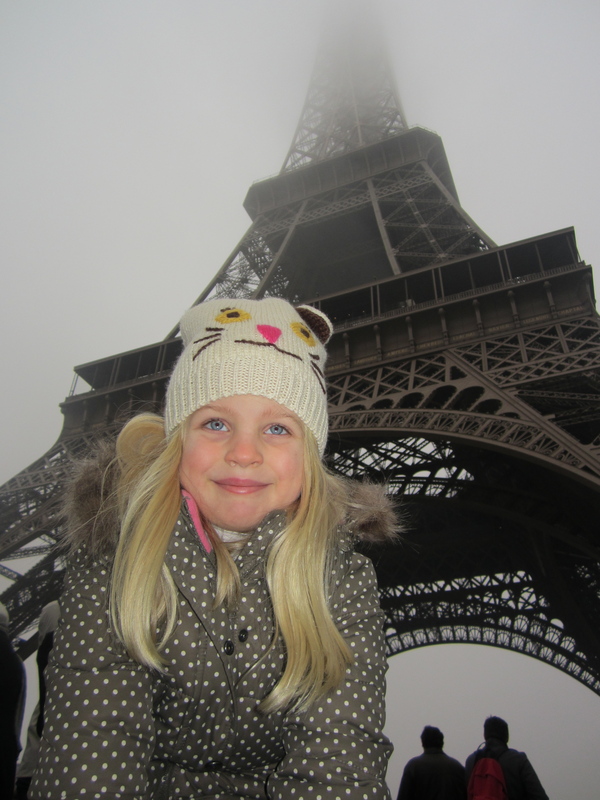 I loved reading your Paris with a five-year-old blog. 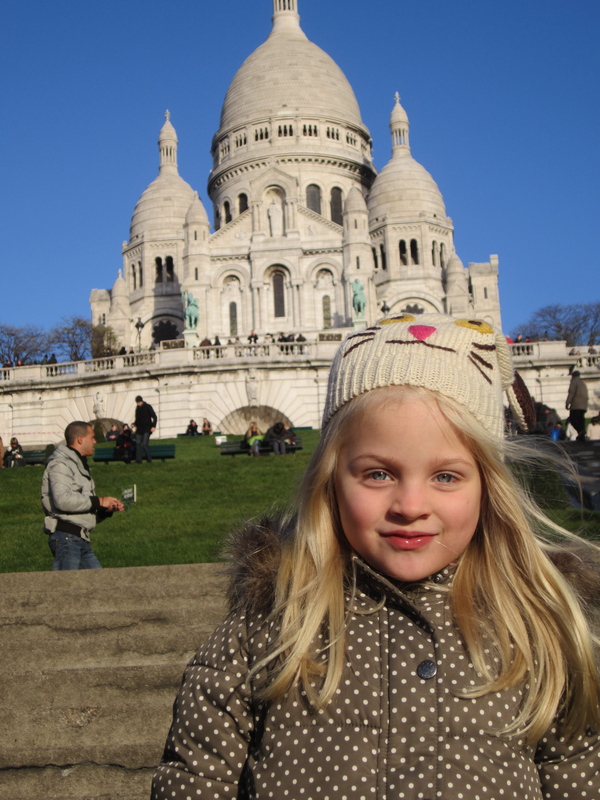 I’ve been to France 3 times but my children, who were young teenagers then, never wanted to come. I guess at 5, your daughter didn’t have a choice. She’s a lucky girl! 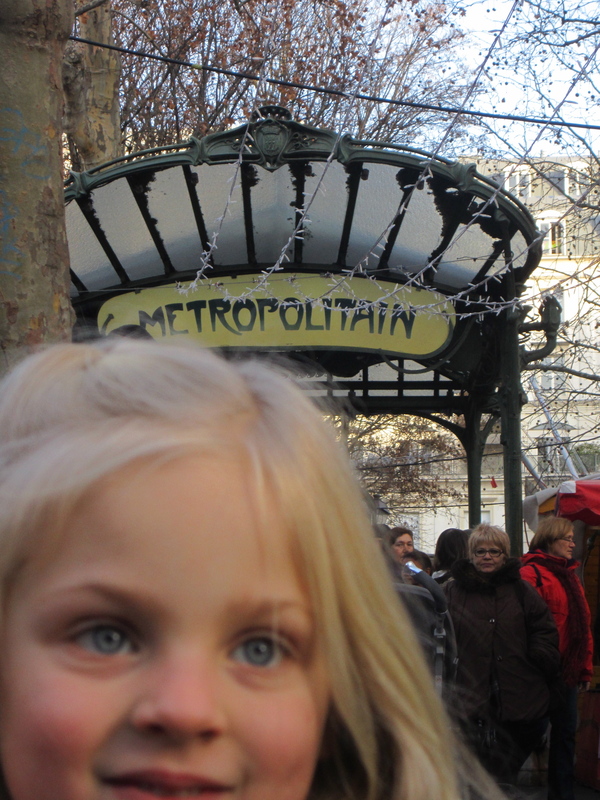 And she makes a Parisian photo even prettier. Thank you, Patricia! I’m so glad you enjoyed it. I’ll bet your kids are kicking themselves now! No, they have never had any desire to go to another country, especially one where they won’t understand the language. 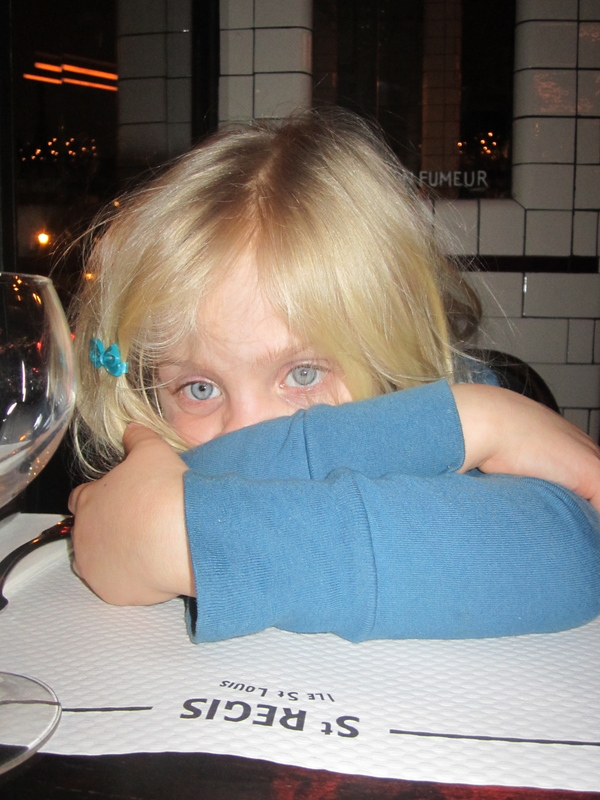 Their father has the same fear, and has never accompanied me to France even though I speak French. 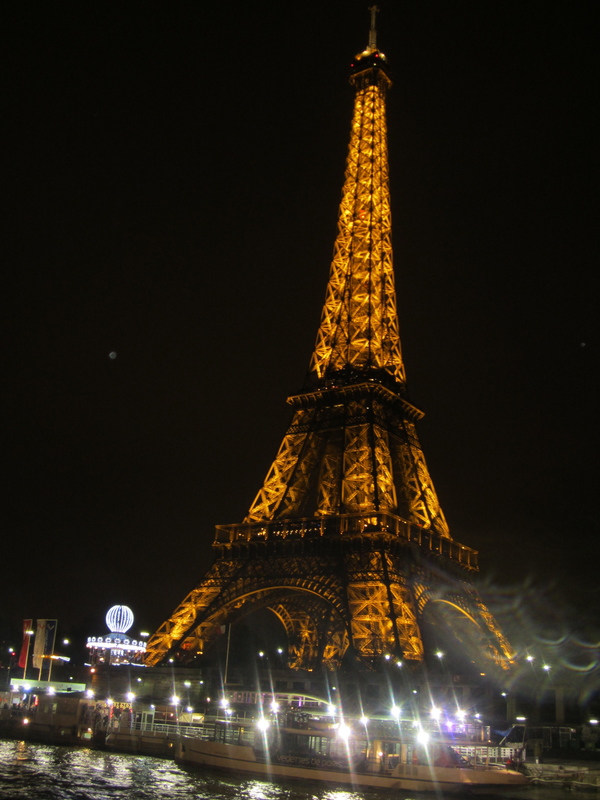 I enjoyed your photos; it was almost as good as being there… Thanks. Jill, I love this! So funny and such great pics! Thanks, Melinda! I really appreciate you taking the time to flip through and comment. 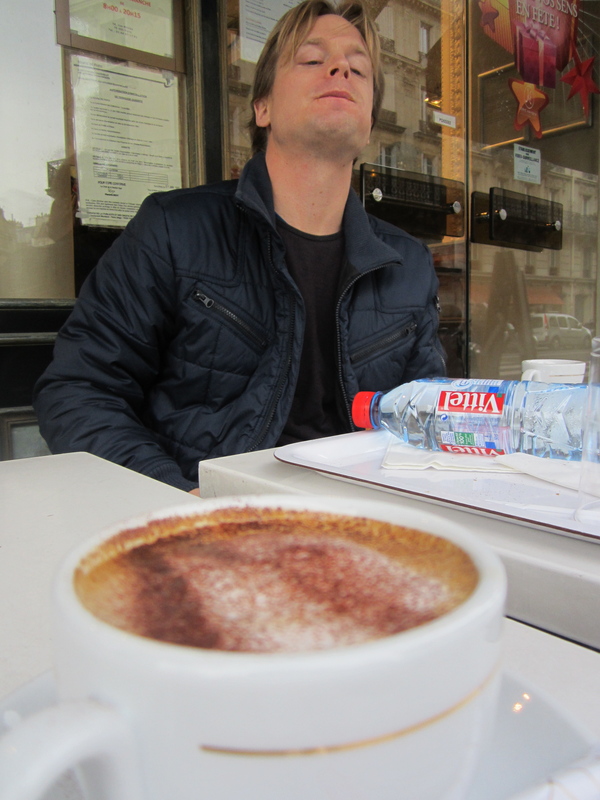 I love how you capture so many details, from stealing bites of pain au chocolat (SP???) to the unruly fog that kept you all from seeing much of the panorama and the little TinTin figurine that gets lost. What fun it would be to go on a trip with you, though I imagine few of us could keep up with the pace of your family. Stella has an incredible amount of energy and curiosity! 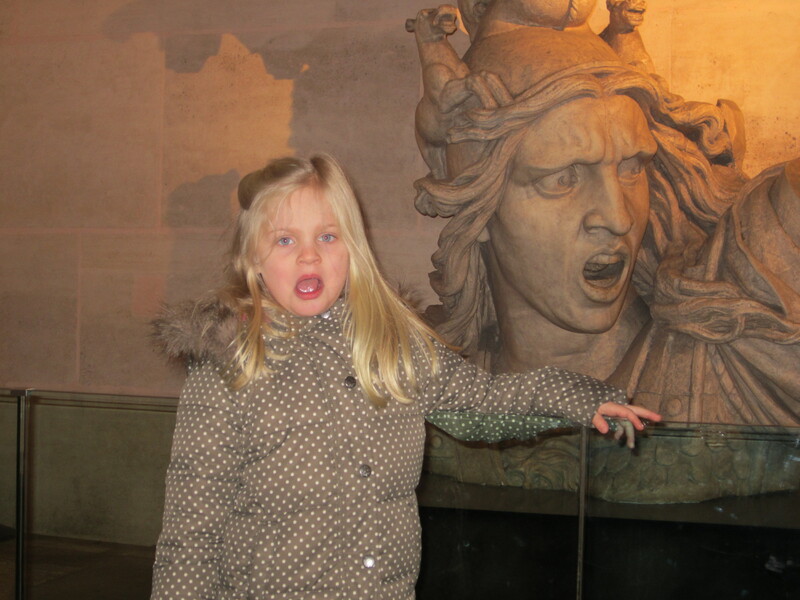 After pics of so many family trips at beaches with children her age, it’s refreshing to see children becoming explorers of urban areas and museums. What’s the next adventure?? 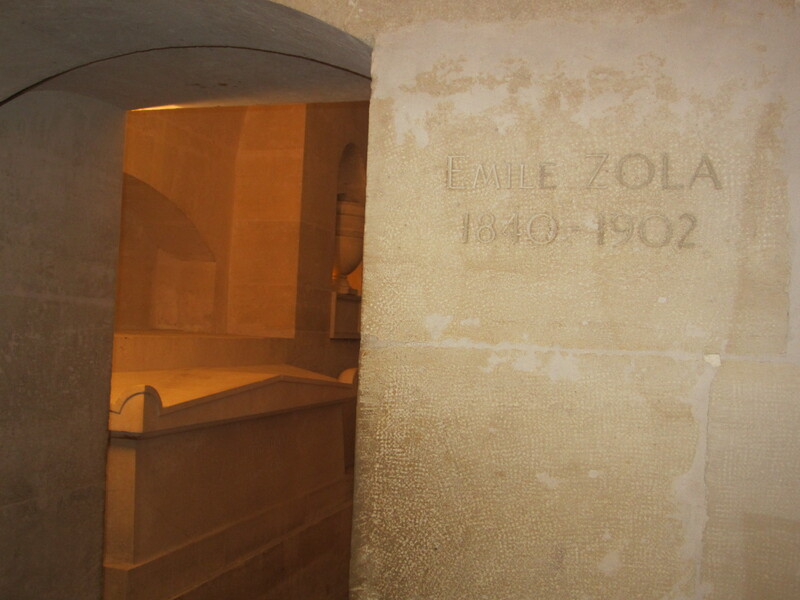 Thanks, TripCase, for linking to my blog! TripCase is a very cool travel app.